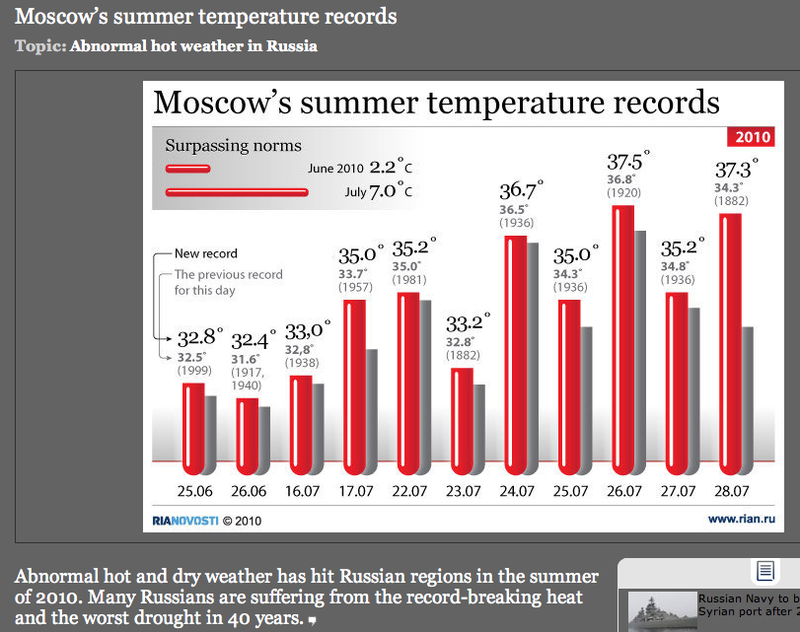 Of course, there are several reasons that 100 F (about 37.8 C) in Moscow is much worse than 100 F in Texas. Here in Texas it is not uncommon; hence both biota and people are used to it. We have air conditioning and heat-hardy plants. Moscow sits surrounded by areas that are normally wet, cool, clammy bogs, but now are dried out and fire-prone. It's around midnight in Moscow. The current conditions are listed as 82.6 F (28.1 C) and "smoke". Normal July high temperature is 73.8 F (23.2 C); August's normal high is 70.3 (21.3 C). Are the current events in Russia "because of" "global warming"? To put the question in slightly more formal terms, are we now looking at something that is no longer a "loading the dice" situation but is a "this would, practically certainly, not have happened without human interference" situation? Can we phrase it more formally? "Is the average time between persistent anomalies on this scale anywhere on earth in the undisturbed holocene climate much greater than a human lifetime?" In other words, is this so weird we would NEVER expect to see it at all? There are two approaches to answering this question. One is statistical (mathematical), and the other is integrative (based on experience and expertise rather than number-crunching). A great deal of what is wrong with the extra-scientific debate is the overvaluing of frequentist statistics in domains where physical experience and understanding applies. Formulating this formally as a Bayesian question is more work than it's worth, I expect. But we still come away with impressions. The statistical approach would be to go over the observational temperature records of the past century until about 1980, looking for a comparable anomaly. We'd have to set some parameters in advance: duration, physical scale, amplitude. Then we could evaluate. If no such events turned up, we would remain somewhat uncertain, the record being too short. If several did, we could easily argue that this event by itself is too "normal" to be "caused by" "global warming". On the other hand, we may well find that anything comparable occurred in the local winter; no summertime warm anomaly of this magnitude and persistence could be found. Or we could argue that this is not an unusual "blocking" event; we have seen persistent meridional winds before. If you look at the pattern, you'll see that it doesn't actually stretch across the whole of Asia; there's a cool zone in the middle between the two hot zones. Now we are asking whether we haven't seen this particular flow pattern before. And I think that, in fact, will turn out to be correct. But right now I feel like hazarding a guess. As far as I understand, nothing like this has happened before in Moscow. I refer you to this paper on heat wave (and cold snap) mortality in Moscow by Revich and Shaposhnikov. Therein a heat wave is defined as a period where the daily average temperature exceeds a monthly average in the 97th percentile at least 5 times, and of those exceeding the 99th percentile at least 3 times. They end up with a threshhold of "extremely hot" of a daily average of 22.7 C (72.9 F) in July, the hottest month. Even the coolest day in our five day forecast is several degrees in excess of this. Today's average temperature is is 29.8 C (85.5 F). They mention in passing that the summers 2000-2005 were hotter than normal, at the 95 % level considering only July and August. They found an average of six days per month exceeding the threshold. "The heat wave of July 2001 was truly exceptional both in temperatures and in length." they say. "In July 2001, daily average temperatures exceeded 25 C for 9 consecutive days (the norm is only 3 days per year). Maximum daily temperatures on these days always exceeded 30C." Barry Brook quotes an anonymous colleague, and agrees. It is clear to me that climate change is now becoming such a strong contributor to these hitherto unimaginable events that the language starts to change from one of “climate change increased the chances of an event” to “without climate change this event could not have occured”. It will take some time to settle out. But we've been so trained on the "loading the dice" thing that we may be excessively reticent. This f***er is weird, and scary, and definitely gets filed in the "no time to relax" folder. Update: While the weather is bizarre, the consequences (the fires and smoke) do indeed have a social component. Yulia Latynina argues in The Moscow Times that forest management was gutted by Putin at the behest of the forest products industry. I am interested to see this story being picked up by rightwing web sites in the US. If this is the story it sure seems like deregulation and business-friendliness at work to me. It seems to refute the libertarian argument that private management is more responsible than public management. Of course, we really need to compare to an alternative universe where the Russian bureaucracy remained in charge; it might well have been no better. Exactly. 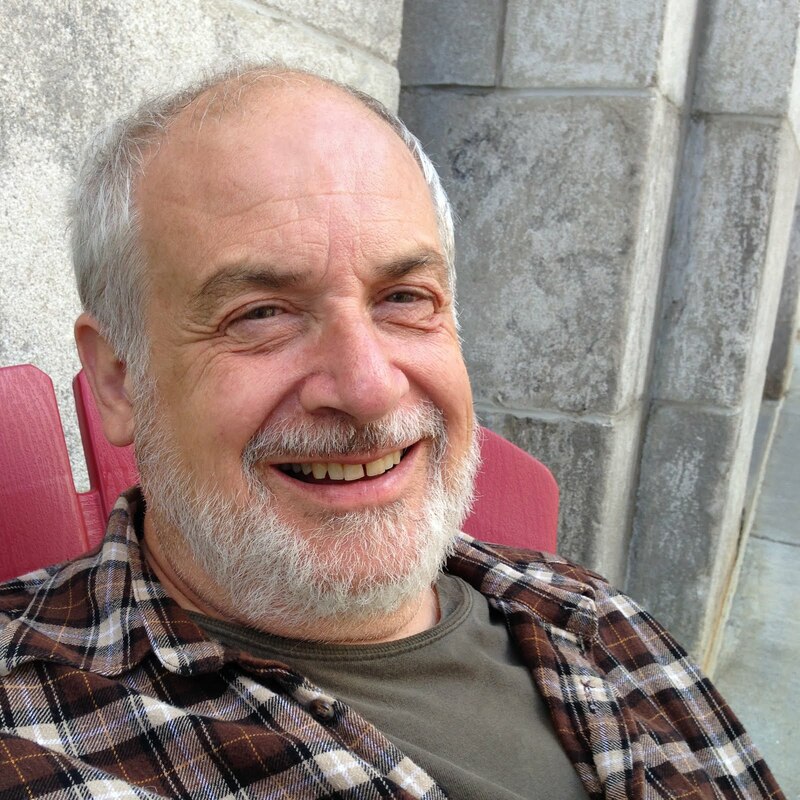 Andy Revkin e.g. is finding it difficult to climb out of that hole. He doesn't appear to have thought the problem through, although he has a lot of company. The difficulty is that there's no logical point at which to *ever* abandon that paradigm, since even in a mid-Pliocene-like climate state of +3C and +25m SLR there will still be plenty (maybe even a majority) of weather events within the range of pre-industrial variability. IMHO Jim Hansen's announcement of a detectable signal was the moment when scientists (and journalists) should have started saying that *everything* is now affected by anthropogenic warming. Waiting until we started seeing individual events far outside the range of natural variability was waiting too long. But now I think the best course is to use the kind of analysis you use in this post to insist that scientists and journalists start describing things using the terms that should have been used twenty years ago. This discussion is very, very important, Michael. I'll do what I can to help spread it around. We really need to understand why this effect hasn't been material for screaming headlines. Bizarrely most journalists don't even seem to know about it. I love that picture of Homo Colossus. It's almost as good as the recent picture of that SUV in Milwaukee that "plummeted into the a chasm that opened up during a deluge". Sorry about the off-topic. Is there anything to add to this piece though? Perhaps this: Jeff Masters reports that Belarus is the 17th country to join the list of countries that recorded their hottest temperature in its history this year. Am I missing something? "Moscow's summer is on course to be the hottest since 1938, although temperatures might fall next month, Dmitry Kiktyev, deputy head of Russia's state weather agency, told Reuters. "The temperature hike this month in Moscow could surpass the 1938 July figures, when the average temperature was 5.4 degrees above the norm," he said." Hasn't been such high CO2 concentrations since the Miocene. Tom, it could well be me that's missing something. Do you have a date for your quote? A reference? Tom's quote is fromhere, dated July 20. That is, Moscow was "on course to be the hottest"
before the seven day streak of daily records, plus however any have been surpassed in the subsequent week, including two all-time records. methinks "Tom" is alerting us to the fact that 72 years ago it was hot in Moscow, so 2010 is no big deal, q.e.d. Also, Boris Worm et al paper on phytoplankton is randomly declared "dubious". Q.E.D. Like shooting fish inna barrel. Devastating stuff, really. Don't see why it's not obvious to you, mt. Climategate. Bye. 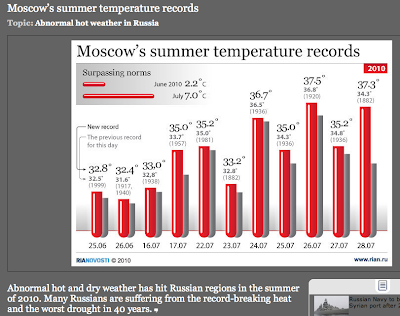 David Appel has an interesting post on the cost of the Russian heat wave. Russia has suspended wheat exports for the year, and the price of wheat jumped. David calculates that the heat wave (and transitively GW) will cost the world 67 billion $ this year in higher wheat costs. An interesting datum to have in your pocket the next time someone says that the cost of avoidance is too high. The cost of inaction is going up, _now_. And doing nothing contributes nothing to setting ourselves free of the entanglements that dependence on foreign oil forces on us. It will gain wheat farmers outside Russia $67 billion, though. The question of what things cost the world in dollars continues to confuse me. At a minimum, I suppose the global loss is the amount of money the Russian wheat would be expected to be worth in a "normal" year. The most important loss is the loss of human potential in poor countries from children who might have thrived given a little more food. Or our own loss of security from those who survive and come to understand that they couldn't compete with our our cattle for feed and become angry. Or something. Optimally we would give starving populations enough resources to survive independent of food prices, but as I understood a couple of years ago that is imperfect. And then there's the population question that shows up unbidden. But I never really put much credence into global costs as estimated from aggregate expenditures. If anyone with some economic training would speak up on this, I'd be most appreciative. Well, the price of wheat jumped 8% on that annoucement. So locally, the wheat farmers are going to see a very good price for a bumper crop of soft white (oriental noodle) wheat. After last year's just about break even or so price on a very large crop of the same stuff. Worse, the Ukrainians may hafta do the same as the Russians. Revkin persists in his errors. maybe this will be the heatwave with most broken daily records in history...? Tom also didn't notice that thus far, temperatures haven't fallen "next month" (August, in the context of when the quote was provided). So it's not surprising that we're now learning that the summer's turning out to be the hottest on record, not just since 1938. I'm still hesitant to move from "loads the dice" into the "this event couldn't have been caused without global warming" realm. So temperatures in the region have warmed by about 1 C over the GISS instrumental record. Using a very simple analysis, if this same weather pattern hit western Russia 100 years ago, it brings temperatures to the same level minus 1 C. As I understand it, Russia has been topping monthly records by much more than 1 C due to this event. So the same weather pattern in 1910 would have been a clear record-setter and record-keeper all the way through 2009. So as seems obvious, I guess what it comes down to is determining if it would have been physically possible for temperatures to reach the heights they did without the warming to date. It's generally more of a matter of probabilities than hard conclusions. which makes the analysis of regional warming above much less adequate. I think the Bayesian vs. frequentist perspectives have played a part all along, and it's nice to see someone mention it formally and clearly. That said, it's often the case that Bayesian and frequentist analyses amount to the same thing, and that the fallout is more from the kinds of questions asked and presentations made. When it comes to attribution, I'm reminded of something Louis Uccelini said after a busted DC snow forecast (paraphrasing), "Give me a year and some money, and then I can tell you why it happened." Unfortunately when you're blogging current weather events for the public(I'm Rob C. at Wunderground), you get neither. So when I write my blog entries, I try to explain what's happening and a plausible mechanism for it. As for what's going on in Moscow, my hunch is that SST teleconnections combined with a warming Arctic are doing all sorts of strange things with the general circulation. The 500-mb height anomalies show that something is definitely going on there. I hope somebody gets a good dissertation out of this. Marion, they are only equivalent when you have enough data, e.g. pretty much the entire distribution. Baysean does better with sparse data (IEHBWO). Bayesian vs frequentist in climate is definitely a topic to pursue. I don't think my mention was clear enough and it certainly wasn't formal, though I appreciate the appreciation. The overvaluing of the detection/attribution question is, in my opinion, a consequence of application of a fundamentally frequentist methodology to a fundamentally Bayesian problem. It's the difference between pharmacy and medicine. Pharmaceutical companies have to do statistics for good reason. Practicing doctors have to manage each patient as an individual and while data are essential, frequentist statistics are useless. The reasoning processes are very different. Alexander Frolov, head of Russia's weather service, said judging by historic documents, this heat wave could be the worst in up to 1,000 years. "Our ancestors haven't observed or registered a heat like that within 1,000 years," Frolov said at a news conference. "This phenomenon is absolutely unique." He said the heat in Moscow reflects the global climate's increased volatility. Ok...so the above seems ambiguous. By "up to 1000 years", are they saying there was definitely a warmer snap then or is that just where confidence ends. And what records are they looking at? Climate proxies? Written evidence? Statistical analysis? I don't doubt that it could be the hottest in 1000 years or much longer, given how previous records have been smashed to bits, but the basis for this is important. I think it pretty clearly states that "nothing like this was observed in the past 1000 years", not that "something like this was observed in the year 1010". Hmm, the blogger comment software ate the embedded link in my prior short comment (re Revkin's continued form), and now I can't find it to re-submit. Fudge. The study NY linked is being conducted by one Anthony Lupo, who IIRC has a bit of denialist form. Rob's mention of the 500-mb anomalies makes me wonder about the status of Stu Ostro's work on the subject. Last time I heard (maybe a year ago) he had found a scientist collaborator to do a paper with, but AFAIK nothing has surfaced so far. I see what you mean, Steve. "A flat earth was once the 'consensus opinion' of science. That opinion has changed in the last 1000 years." Oh well. Maybe his published work is of better quality. Ironically, he's studying this blocking stuff with researchers in Russia. Not to pour cold vodka on the forest fire. but what's happened so far is small beer compared to the conflagrations that swept the Siberian taiga in 1915. "As for what's going on in Moscow, my hunch is that SST teleconnections combined with a warming Arctic are doing all sorts of strange things with the general circulation. The 500-mb height anomalies show that something is definitely going on there. I hope somebody gets a good dissertation out of this." Ooooh, it's complex. In the UK, I've been wondering where summer went: a lot of July and August has been cold and soggy. Is anyone able to tell me whether heat further North and coolness here could be related? I know the NAO flips, but what's happening now? Like, increased prices affect different groups differently, depending on if they're net food buyers or sellers - and many of the world are the latter. And that urban poor get affected badly by price rises, rural poor may often benefit. That doesn't address, for me, the fact the world food commodity prices appear to be set through a few very narrow futures-buying channels. I'd love to see a good diagram of this. The Moscow heat wave may millennial, but thet Rusian forest fires so far fall short of being the worst in a century. Russell, thanks for your input. That is an interesting event, indeed. On the other hand, there wasn't a megacity of population ten million in the smoke plume at the time. Thank God Global Warming is a Hoax! Too Much Emotion? Or Not Enough?